With all of these holidays just around the corner, we are coming up on the most wonderful time of the year…and the most expensive. The holidays are all about being with your loved ones, being grateful, and celebrating. With those come lots of gifts, travel expenses, and (thankfully) time off of work. So while we are enjoying our well-deserved time off, the last thing we want to think of is the adding up costs. 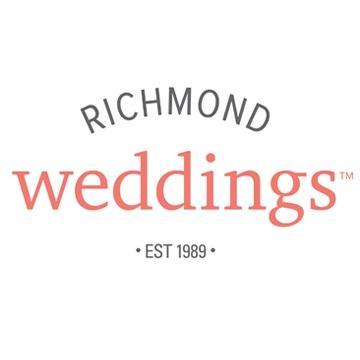 With all this love and happiness in the air, we want to be able to celebrate at our holiday parties without stressing over how much we spent just to make them happen! Below I have provided 5 low-budget ways to keep your holiday party classy, decorative, and fun for the holidays! A little can go a long way when it comes to table settings. While you might think your table needs to be overflowing in centerpieces and fancy dishware, you can create something just as pretty and tasteful with a few simple pieces. Create a unique look by mixing up your china patterns! One example I found in this article, which I LOVED, involved mixing a simple white dinner plate with a glass salad plate. I went ahead and recreated this image with some of our own rental items, but with a few tweaks of my own. 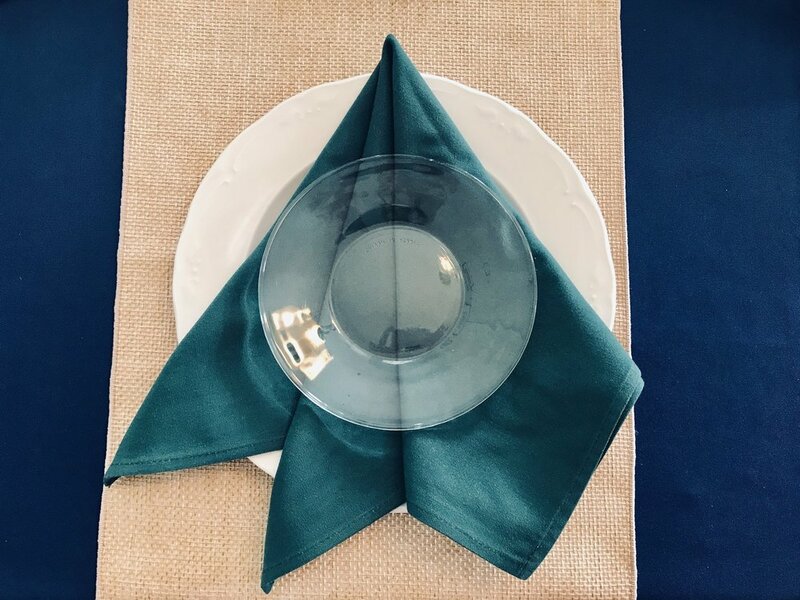 As seen in the photo above, a little color can go a long way; especially when you go the extra step and use cloth napkins. Taking this small step is an inexpensive way to add a little more class to your dinner. 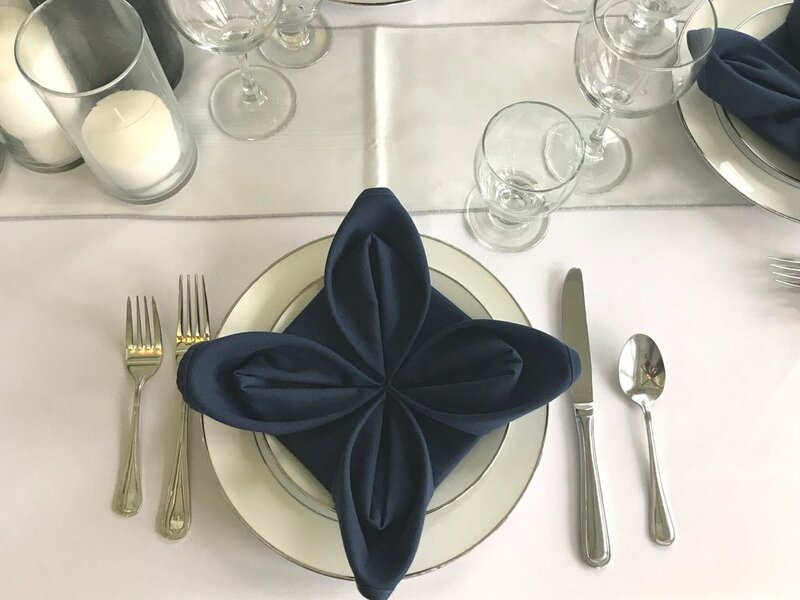 Even if you are not having a sit down dinner, including a pop of color in your napkins can still add some flair without too much extra cost. 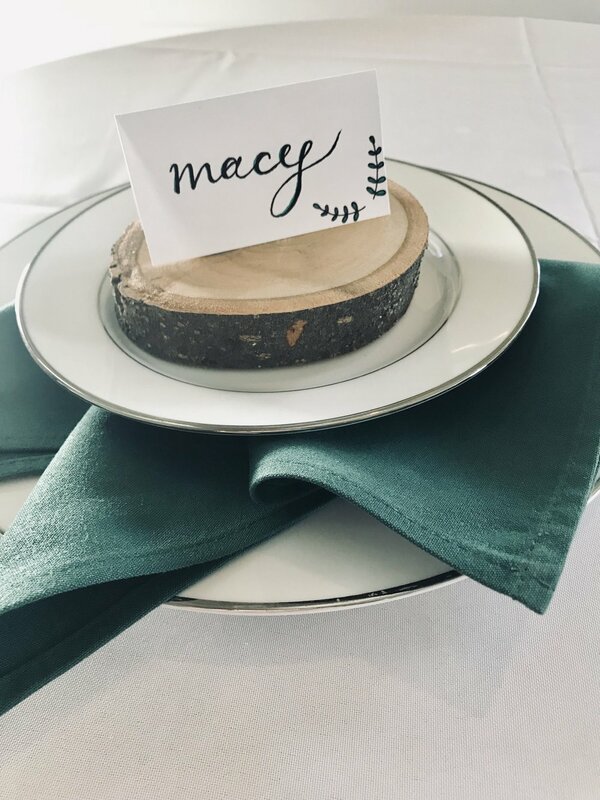 Creating your own name cards is a super simple and fun way to add a personal touch to your table settings. Name cards can be made with the most basic of items and will not stretch your budget too much. By using scrapbook paper, dollies, or basically any crafting supply you can find, you can create some beautiful name cards with hardly any extra work. From writing them out yourself to printing them off the computer, name cards can easily be customized to fit any kind of holiday party you are having. We had a woman come in a few weeks ago who shared a GREAT idea with us! She was using our bar set up to create a candy bar at her baby shower. Honestly, I had never even considered using our bar for anything other than drinks. She explained how she was going to use the top bar to display the candy and then leave some room on the bottom table for people to fill their bowls and what not. For the holidays you can do something very similar by having all of your guests bring their own desserts for a dessert bar! With plenty of space to display all these tasty treats, you can provide your guests with a multitude of options to choose from and get them involved in the party itself. This unique way of displaying your treats will also save you some space for all the other party activities you will have going on. And let’s be honest, during this time of the year; desserts, cookies, candies, and treats are what everyone wants to indulge in at holiday parties. Most people think that dressing up a table takes a lot of effort and work, plus a lot of money spent on useless items. However, this does not always have to be the case! One rental item I find myself CONSTANTLY recommending to our customers is sashes! With such a wide variety of colors and fabrics, sashes can be used in almost any part of your decor. From using them as a runner along your tables or scrunching them up around your centerpieces; sashes are such an inexpensive way to add an extra touch. They can also be wrapped around your chairs in about a hundred different ways! Just search chair sashes on Pinterest and the options are limitless! If you are not able to have some type of bar set up at your holiday party, a unique alternative would be to create your own drink tubs and stands. 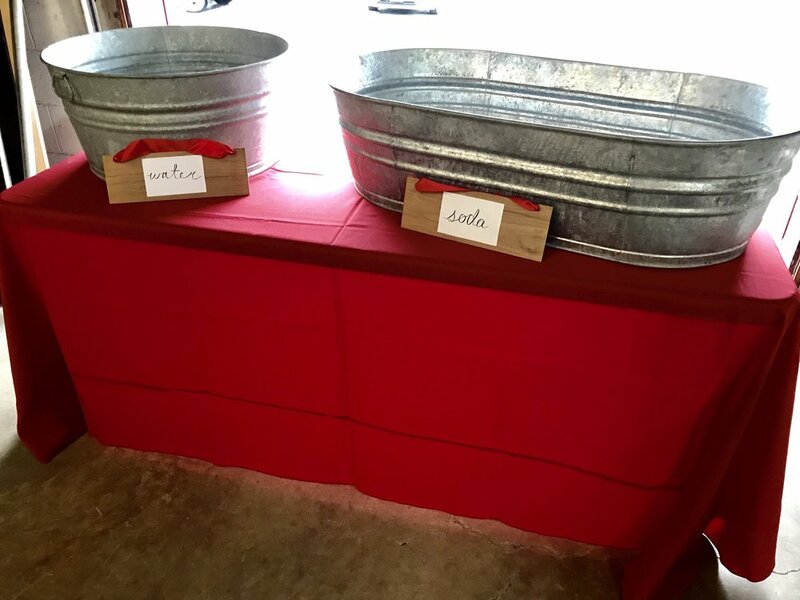 Using a tub, such as our galvanized tubs pictured above, as your drink display is such a quick and easy way to navigate around not having a bar present. The only other thing you would need would be a table to place your tubs on or you could even just set them on the floor if you like! Simply fill your tub with whatever drinks you would like, create a cute sign using some of those craft supplies we talked about earlier, and let the holiday party begin!